If you happen to follow A Blog Voyage, you will see that we have gone through another burst of posts, from our amazing trip to Mexico. Such an amazing country! Thank you to Matt & Diana for inviting us to their wedding and giving us the best reason to visit! We had a marvelous experience and the country lived up to all the dreams we had for it – and more! Highlights included:Looking forward to our return trip! Please be patient while updating the site’s theme to the excellent Standard Theme. This will be making the blog a bit faster and easier to use. You may see some funkiness over the next weeks as we fine tune the customization. As always it is our goal to present fun, pretty and the special places to visit around the globe. We search and search and use our innate ability of un-relenting un-compromise to find the places that satisfy our standards. It is our pleasure to share those deemed ‘blog-worthy’ with you! We hope that you will continue to journey with us and that you enjoy our explorations. If you have anything to share, whether it be about a trip, experience or blog related, we would love to hear from you! 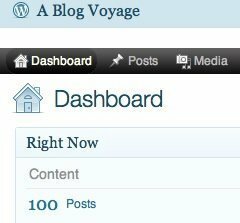 We’re very happy and proud that we have finally put together 100 posts here on A Blog Voyage. It is always interesting to put your experiences and thoughts out to the world without knowing how they are received or if anyone is really paying attention! In that way I guess blogs are a bit like SETI! But we are feeling quite good about the content we are creating from our life’s experience and hope that you are able to take some small joy in it as well. Caravan is a wonderful ‘flea market chic’ boutique, in the heart of Spitalfield’s market, London. Interior stylist and author Emily Chalmers has collected an array of charming little objects. They tantalize with their complete needlessness and their absolutely irresistibility. You know you will be taking something home or for a friend. Who can resist the egg-warming-hats? Aside from the variety of small objects, the store also carries some interesting furniture pieces, Deborah Bowness hand printed wallpaper, lamps, throw pillows and other home items. Apologize for the lack of posts recently. We are preparing for a big trip and have been a bit busy with that. Look for a return to force in January of 2010!! Nopalito, the smaller offshoot of Nopa, presents local and organic Mexican cuisine with authenticity. There are plenty of vegetarian options and the meals are exquisitely tasty without being heavy and greasy. The ultimate test is passed by the house hot sauce provided with each dish; peppers are peeled then charred, giving a delicious and gentle smoky flavor. The service was friendly and fairly attentive. We loved the fact that they took our cell number so we could wander the neighborhood while we waited for our table. This is so simple I’m amazed I come across it so rarely. I poked my head into Nopa (about 2 blocks away) and it looked like the large upscale eatery that it is- next trip to San Francisco! The dish that surprised us the most was the Sandia con Chile y Limón. Which is slices of sweet crimson watermelon, chile de arbol, chile guajillo and lime. This is one of those combinations that I never would have thought of, but makes oh so much culinary sense. The Tamal de Queso Estilo Corunda (Housemade masa, queso cotija, grazzini squash, poblanos, tomatoes, manzanos chiles and crema) was another soft delight. The masa really contains a quality that speaks for dedication. The dish that we ordered twice was the Quesadilla Azul de Hongos (Blue corn tortilla, mushrooms, corn, poblanos, jack cheese, queso fresco and salsa de molcajete). The mushrooms were deep and flavorful – and this combined with the smoked hot sauce was stunning. Mexican cooking is on the west coast is an entire step above that on the east. We really enjoyed the variety and effort that was put into bringing this wonderfully diverse deliciousness to our plates. Nopalito a true taste of contemporary culinary artistry!